A 31-year-old male who presented with a palpable purpuric rash which was later diagnosed as hypersensitivity vasculitis secondary to the administration of yellow fever vaccine. A 31-year-old male presented with complaints of pinpoint, palpable purpuric rash on his palms and legs. He had no history of allergic reactions, connective tissue disease, respiratory tract infection, and/or use of antibiotics or another drug intake before the onset of the rash. He described that about 10 months back, he presented with a similar rash on his legs. The rash was bigger and covered a larger area on his legs. Examination of the pictures, at the time of presentation, revealed multiple palpable, purpuric violaceous papules coalescing into serpiginous plaques with large adherent black eschars overlying his lower extremities [Figure 1]. He underwent a skin biopsy at the start of his treatment that showed vasculitic changes. Skin biopsy and direct immunofluorescence showed immunoglobulin A (IgA), C3c, and fibrin deposits on the vessel walls. He was started on systemic steroids prednisone 1 mg/kg body weight by his then treating consultant for 3 months. He stopped his medication at the end of 3 months; however, on discontinuing his tapered steroid medications, he again developed the vasculitic skin rash for which he was advised the steroids at a higher dose for 6 more months. The rash partially cleared up and became small, pinpoint, purpuric rash; however, at the end of the treatment period, he developed weakness in both legs and was unable to walk. Evaluation by his orthopedist from magnetic resonance imaging of both hip joints showed avascular necrosis of both hip joints and was advised bilateral hip replacement. The patient subsequently visited our clinic for an allergy and immunology workup. On physical examination, no abnormalities were found and examination of the skin revealed the presence of around pinpoint, purpuric rash on his palms and legs, which comes spontaneously and clears up within 48 h. The rash was not itchy but has mild burning quality to the rash. The elevated palpable purpuric lesions were 2–3 mm in diameter, all at the same stage and did not blanch on pressure [Figure 2]. He was advised the following investigations to find out if there was any systemic underlying illness associated with his cutaneous vasculitis. The patient was concerned about any underlying food allergic triggers and his food allergy panel and in vitro serum IgE antibodies to food allergens were normal. On further history taking, for use of any supplements or medications, vaccinations, the patient told that the lower limbs purpuric rashes started 2 weeks after his yellow fever vaccination, which was a travel prerequisite. Based on the investigations, hypersensitivity vasculitis was proposed as a possible etiology of his vasculitis. The patient reported that after a year, he underwent bilateral hip replacement, and because of the ongoing rash, he is currently on methotrexate 7.5 mg weekly along with aspirin 150 mg for the marginally elevated lupus anticoagulant. Hypersensitivity or leukocytoclastic vasculitis (LCV) refers to a group of immune complex-mediated vasculitides which are characterized by acute inflammation of small blood vessels manifesting as palpable purpura. The organ involved is usually the skin, but other organs are less commonly affected. LCV, also known as hypersensitivity vasculitis and hypersensitivity angiitis, is a histopathologic term commonly used to denote a small-vessel vasculitis. LCV classically presents as palpable purpura. Less common clinical findings include urticarial plaques, vesicles, bullae, and pustules. There is acute inflammation of small blood vessels (arterioles, capillaries, and venules) with neutrophilic infiltrate in the vessel wall. Leukocytoclastic refers to nuclear debris from disintegrating neutrophils which undergo karyorrhexis. Henoch–Schonlein purpura (HSP), a specific subtype of LCV warranting separate discussion, is characterized by predominant IgA-mediated vessel injury, and there is extravasation of erythrocytes. LCV, also termed hypersensitivity vasculitis, is a small-vessel vasculitis with a reported incidence rate of about 30 cases per million people per year and is thought to affect men and women in equal numbers. The criteria of the classification of hypersensitivity vasculitis are age at disease onset >16 years, medication at disease onset, palpable purpura, maculopapular rash, and biopsy showing granulocytes in a perivascular or extravascular location. The presence of any three or more criteria has been shown to have a sensitivity of 71% and a specificity of 84%. Cutaneous vasculitis often presents as palpable purpuric lesions that may be generalized or limited to the lower extremities or other dependent areas. Urticarial lesions, ulcers, and hemorrhagic blisters also occur and may involve other organs such as liver, kidney, brain, and joints. In the absence of internal involvement, the prognosis is excellent, with the majority of cases resolving within weeks to months. Approximately 10% of patients will have chronic or recurrent disease. Leukocytoclastic vasculitis may manifest as a cutaneous eruption only, or it may occur in conjunction with any of the following collagen-vascular disorders, paraproteinemia. An accurate diagnosis of medication-induced LCV depends on conducting a thorough history including chronological association of initiation of medication and development of LCV. Comprehensive examination, exclusion of other potential etiologies, and supportive histopathology are essential. Hypersensitivity vasculitis presents usually as drug- or infection-induced purpura and involves dominantly the small vessels. The disease has been reported to be triggered by many factors including bacterial infections, drugs, immune complexes, blood stasis, and systemic disease. Consideration should also be given for an underlying disorder, such as collagen-vascular disease, including rheumatoid arthritis, systemic and cutaneous lupus erythematosus, and Sjogren's syndrome, hepatitis, and history of blood transfusion. The most common drugs that cause LCV are antibiotics, particularly beta-lactam drugs, aspirin, nonsteroidal anti-inflammatory drugs, diuretics, allopurinol, metformin, and other sulfonylurea antidiabetic drugs. However, almost all drugs are potential causes. Foreign proteins such as streptokinase, those found in vaccines, and those used in monoclonal antibody therapy can be associated with a serum sickness syndrome with LCV. Furthermore, implicated are certain foods and food additives, oral or parenteral medications, infections – streptococcal infections or viral hepatitis, Epstein bar virus infection, HIV, and tuberculous infection. It is also important to rule out any underlying malignancy. LCV may be associated with underlying malignancy and may behave as a paraneoplastic syndrome. Additional questions should be asked regarding new prescription, over-the-counter, and herbal medications, as well as dose changes in preexisting medications. A thorough social history should be obtained regarding recent travel, new environmental exposures, and illicit drug use. Between one-third and one-half of LCV cases are idiopathic. Drug-induced LCV may present with nonspecific signs and symptoms such as arthralgias, myalgias, fever, weight loss, lymphadenopathy, and palpable purpura in the absence of associated major organ involvement. In addition, there can be slight elevations in antiphospholipid antibodies, such as IgM anticardiolipin antibody without known associated thrombosis. Cutaneous biopsies are essential and demonstrate prominent granulocytic inflammation with leukocyte nuclear fragments, extravasated erythrocytes, and vascular mural fibrin deposits. In our patient, the biopsy findings were consistent with leukocytoclastic vasculitis, and probably of the Henoch–Schonlein variant. Classically, HSP has been considered a subgroup of hypersensitivity vasculitis. Medications have been implicated as etiologic agents in up to 13% of LCV cases. The resultant increased vascular permeability, inflammation, and hemorrhage produce the well-known clinical lesions of LCV. The vascular damage is believed to be triggered by the deposition of immune complexes in vessel walls, with activation of complement cascade. Polymorphonuclear leukocytes then migrate to the area and release lysosomal enzymes that damage blood vessels, leading to extravasation of erythrocytes, fibrin deposition, and necrosis. Because leukocytoclastic inflammation is such a prominent feature, these lesions are referred to as “LCV.” When the triggering antigen is drug, the term “hypersensitivity” seems apt. Depending on the extent of cutaneous and organ involvement, more intensified treatment options can be considered such as systemic corticosteroids. Chronic low dose or a tapering course of corticosteroids may need to be used in the months following discontinuation of the medication to prevent recurrence of symptoms, depending on the severity of the initial outbreak. Although immunofluorescence characteristically shows IgA deposits within vessel walls in HSP while, in most other types of LCV, IgG, or IgM deposits are seen. In our patient, lymphocytic infiltration may be due to delayed biopsy in resolving phase and IgA and IgG deposits do not exclude a LCV. Our case report is unique in the presentation of Henoch–Schonlein variant of hypersensitive vasculitis. 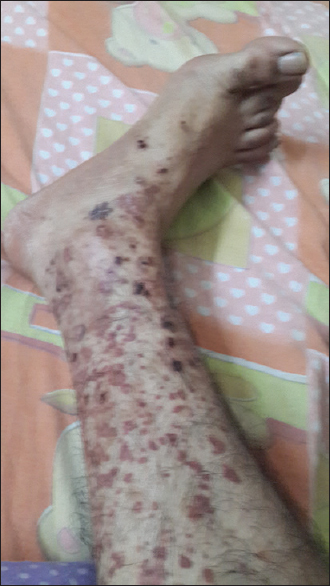 This variant of HSV in our patient is complicated by his onset of avascular necrosis of hip joints due to use of high dose of corticosteroids. This highlights the importance of addition of steroid-sparing immunosuppressant such as methotrexate or cyclosporine earlier in the treatment regimen. The avascular necrosis can also be due to the underlying systemic vasculitis. Avascular necrosis is characterized by osseous cell death due to vascular compromise. There are some reports in the literature of hypersensitivity vasculitis after influenza vaccination has been reported. LCV has also been reported following the administration of the pneumococcal, meningococcal hepatitis A, and hepatitis B vaccinations. Onset after these vaccine administrations similarly ranged from 7 to 14 days. Johnson EF, Wetter DA, Lehman JS, Hand JL, Davis DM, Tollefson MM, et al. Leukocytoclastic vasculitis in children: Clinical characteristics, subtypes, causes and direct immunofluorescence findings of 56 biopsy-confirmed cases. J Eur Acad Dermatol Venereol 2017;31:544-9. González-Gay MA, García-Porrúa C. Systemic vasculitis in adults in Northwestern Spain, 1988-1997. Clinical and epidemiologic aspects. Medicine (Baltimore) 1999;78:292-308. Calabrese LH, Michel BA, Bloch DA, Arend WP, Edworthy SM, Fauci AS, et al. The American College of Rheumatology 1990 criteria for the classification of hypersensitivity vasculitis. Arthritis Rheum 1990;33:1108-13. Bircher AJ, Scherer K. Delayed cutaneous manifestations of drug hypersensitivity. Med Clin North Am 2010;94:711-25, x.
ten Holder SM, Joy MS, Falk RJ. Cutaneous and systemic manifestations of drug-induced vasculitis. Ann Pharmacother 2002;36:130-47. Fauci AS, Haynes B, Katz P. The spectrum of vasculitis: Clinical, pathologic, immunologic and therapeutic considerations. Ann Intern Med 1978;89:660-76. Sanchez NP, Van Hale HM, Su WP. Clinical and histopathologic spectrum of necrotizing vasculitis. Report of findings in 101 cases. Arch Dermatol 1985;121:220-4. Gibson LE, Su WP. Cutaneous vasculitis. Rheum Dis Clin North Am 1990;16:309-24. Smoller BR, McNutt NS, Contreras F. The natural history of vasculitis. What the histology tells us about pathogenesis. Arch Dermatol 1990;126:84-9. Famularo G, Nicotra GC, Minisola G, De Simone C. Leukocytoclastic vasculitis after influenza vaccination. J Clin Rheumatol 2006;12:48-50. Barbaud A, Deschildre A, Waton J, Raison-Peyron N, Tréchot P. Hypersensitivity and vaccines: An update. Eur J Dermatol 2013;23:135-41. Yochum T, Rowe L. Essentials of Skeletal Radiology. 2nd ed. Baltimore: Williams and Wilkins; 1996. p. 1260-3. Fox BC, Peterson A. Leukocytoclastic vasculitis after pneumococcal vaccination. Am J Infect Control 1998;26:365-6. Lambert EM, Liebling A, Glusac E, Antaya RJ. Henoch-Schonlein purpura following a meningococcal vaccine. Pediatrics 2003;112:e491. 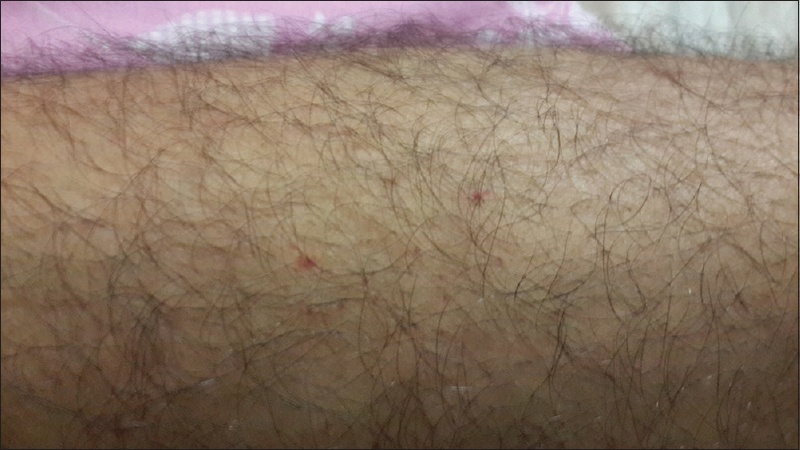 Jariwala S, Vernon N, Shliozberg J. Henoch-schönlein purpura after hepatitis A vaccination. Ann Allergy Asthma Immunol 2011;107:180-1.